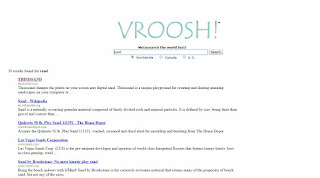 Vroosh.com is a meta search engine from Canada. Who is behind it is not known. Vroosh started in 2001 with a Canadian and a .com domain. It offers a search for Canada and the USA and a worldwide search. Vroosh uses a metacrawler that searches the content of various web search engines and re-evaluates the content according to its ranking in these search engines. In the past, FTP and MP3 searches were offered in addition to web searches. »All returned metasearch results at VROOSH.com are sorted with the most relevant internet results first. The relevance is determined by how many search engines have the web site listed, how well it is ranked with each particular engine and the overall relevance to the actual word or phrase searched. The number of asterisks beside each result indicate the overall relevance.